Updated: June 22, 2016. As relevant and fresh today as it was back in 2009. This is perfect for those no-cook days and nights we all are having in our lazy days of summer. It also works with the many new veggies we are finding in the farmers' market. You can add in fresh zucchini, string beans or snap peas, all will work well, I'd shred or julienne the veggies for best taste and texture. I'd forgotten about this salad dish, idea "borrowed" from the original Sabrina's Cafe on 9th and Catherine in the Italian Market. We used to frequent Sabrina's years ago, in our Pre-Weight Watcher's Days and before the line to get into Sabrina's snaked into the Italian Market and up 9th Street. Back then I ate a full portion of the stuffed french toast with loads of butter and syrup, sides of scrapple and bites of whatever Liz was having. If I went for the lunch entrees, the sides would be those addictive sweet potato fries and a version of carrot, ceci and feta salad. I never knew the exact recipe, I'm not sure anyone did, it seemed to vary from day to day, the cooks tossed in whatever looked good at the moment. This recipe is a no-cook easy to pull together salad. To tame the bite of red onions, or any onion that will be eaten "raw", cook/cure it with an acidic bath. By that I mean, slice, dice or chop the onions and then sprinkle them with a pinch of salt and a few tablespoons of lemon or lime juice or red, white or cider vinegar. Allow the onions to soak for 20 to 30 minutes, then rinse under cold water and drain. Add the now "cooked" onions to your salad. The sulfuric and onion bite will be diminished greatly. You only need a handful of ingredients, this will grow before your eyes, as with most cold salads, once you start to add ingredients, you wind up with more than the sum of the individual parts. Usually I use Fat Free Feta cheese, but lately I have not had good luck with either finding in in the grocery store, or when I do find it, it's gone bad. Since feta cheese is not a high fat cheese, I splurged and used the real stuff. This recipe calls for such a small amount that at 70 calories a tablespoon, it was hardly worth the effort to look for fat free. I'm including a dressing recipe for the salad, however, if you have a good bottled vinaigrette, use it. 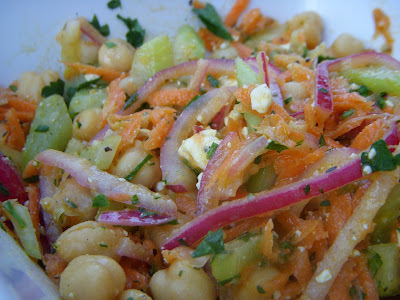 I once posted a recipe on my other blog for a salad I made when I was in Italy in 2007, which used fava beans and feta - you can check out this version here. Prepare the red onion before prepping the other vegetables. Slice half of a medium red onion into thin half moon slices. Sprinkle with a pinch of kosher salt and two tablespoons of cider vinegar. Set aside to soak for 20 to 30 minutes, then drain and rinse under cold water. Add the cured/cooked onions to a large mixing bowl. Make the salad dressing by whisking together all of the dry ingredients and the cider vinegar. Slowly drizzle in 1/4 cup of the olive oil. Taste and adjust the seasonings, adding a pinch more salt, pepper, sugar or herbs if needed. If the dressing is too tart/acidic, drizzle and whisk in more olive oil. Set dressing aside while you prepare the vegetables. Peel and wash the carrots then grate them on the large holes of a box grater. If using a food processor, use the shredding blade, not a julienne blade. Dice or cut on a bias the celery, about a 1/4 inch thick by a 1/4 inch wide. Add the grated carrots and diced celery to the cured red onions and set aside. Slice the radishes into thin rounds and add them to the onion/carrot mixture. Add in the 1/2 of the minced parsley, the drained and rinsed ceci beans and crumbled feta. Pour the salad dressing over the vegetables and toss gently to combine. Garnish the salad with the remaining minced parsley. Refrigerate and serve cold. Makes about 6 cups of salad - or will serve 8 as a side salad.